As many of you will be aware the Friends Group was formed more than a year ago but it took some time to sort through the formalities, and then apply for Charity status and then what seemed much longer to actually have some money in the bank account. However in the last year things have certainly moved on a pace. Much of what we have achieved is down to fact that we have a very hard working committee and I would like to thank each and every one of them for their support throughout the year. It seems a bit unfair to single out anyone from the committee as they have all contributed in different ways, however tonight I have to mention Mike Milne who has masterminded the building of our website and put a huge amount of work into it. The site is still in its infancy but in the short time it has been live has attracted many people. 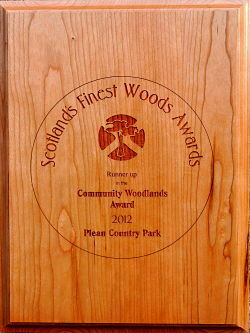 I would like tonight to officially launch the site which can be found at pleancountrypark.org.uk. I would encourage people to visit the site and would appreciate feedback, good or bad which will help us to develop it further. The committee has brought together many projects including planning and holding fundraising events which have been a big success and brought many more people to the park and money in the bank. All very worthwhile at the end of the day, albeit, sometimes a bit stressful. It will get easier in time I am sure but it has certainly been a big learning curve. I would like to say that the committee alone cannot do everything and it would be great if more people were able to give even an hour of their time to become involved. Being a Friend of the park does not mean having to attend every meeting, every work day and every event. I appreciate we all have busy lives but a small amount of time can make a big difference. Some of the money raised at these events has enabled us to provide refreshments to volunteers who have carried out a lot of hard work in the park. We have built up a good relationship with volunteers from other groups, many of them introduced to us by Jennifer Davidson, our Countryside Ranger with whom we work very closely. They have worked with others from within our group and become a valuable resource during action days held in the park. A variety of practical tasks have been carried out by them, including cleaning out sections of ditches, clearing invasive rhododendron, wood clearance, path clearance, painting and general clearing up. Volunteers including some with a particular interest in the horse trail have put a lot of work into keeping the trail clear throughout the year. The Monday Health Walks run by three walk leaders from the Friends Group have proved popular and have received a fair bit of publicity in newspapers magazines and various websites. We have built up a regular group of about 20 people who come from a variety of towns and villages within the central belt who look forward to coming here and enjoying the peace and tranquility in the park. Everything I have mentioned up until now has helped to promote and enhance the area but the biggest changes have been brought about by gradual implementation of the Masterplan which by now most people have heard of. It is something which myself and our Treasurer Wendy have spent a fair bit of time on as representatives of our group and ultimately the park users. Since the earliest days of the Friends Group we have regularly met round the table and on-site with Jennifer and Stirling Council Officers to move forward with the plan for the park produced in consultation with the public by a firm of Landscape Architects. We have a great relationship with Jennifer and I would like to thank you Jennifer for all the support, help, advice and particularly your valuable time that you have given us. We have a good working relationship with officers of the council and in particular Land Services which has helped ensure that both maintenance and improvements have been carried out within the park for the benefit of all users. Because of this we have been able to push for significant expenditure which I am confident has come about as a result of the Friends participation and a great deal more than has been invested in a long time. It has meant that we have seen a number of projects implemented as part of the long term plan. a full complement of picnic benches including four new metal ones which allow disabled access and better access from the car park to the core areas of the park. The small interpretation boards installed together with replacement signage, notice boards and litter bins currently on -site and soon to be installed will all add to the visitor experience. Another project carried out as part of the masterplan has been the planting of fruit trees in three different sections of ground providing a mixture of apple, plum and greengage. This was a joint venture during which Plean Country Park hosted an Orchard Workshop run by Forth Valley Orchards and attended by some Friends members in order to gain skills to look after the orchards in Plean. A grant was obtained to purchase trees, stakes and tree guards and some of the trees were planted during the workshop. The Friends then organized volunteers for another action day when they planted the remainder of the trees. One area of the park which has seen big changes is an area across the far side of the main meadow known as the fireponds. An area which featured in the Masterplan as it was not accessible to anyone other than the very sure footed. A large amount of path works and the installation of a bridge have opened up a whole new area. The Friends were pleased to be able to contribute financially to this project and to provide volunteers to clear an area of woodland nearby of rhodies. To be honest I could go on but if I do you will probably all fall asleep. I think it safe to say that we have come a long way. With the new financial year started we will now put together projects for the coming year and in addition to money from Stirling Council for Capital Projects we will look at finding additional funding to keep up the good work. One project we would like to implement this year is a children's play area of some type. This would be a good opportunity for some young mums with children to come forward to help with ideas and work with the group.